I don't know how it took me all this time before I finally discovered Moondog. But, thanks to the glory of the internet, once I tasted a few drops of his music it wasn't long before the floodgates opened. (clothes which he made himself), spear included. The blind man's sound is spellbinding, intoxicating, invigorating, enchanting---often a Native American-influenced thumping drum pattern forms the spine of his symphonic melodies with their whistling flutes, moaning horns, or lilting violins. Together with the indigenous tribal thump, his music is known for incorporating the sounds of the world, whether it's animals (frogs croaking, birds squawking), the crashing ocean waves, a boat's foghorn, or the grumbling of car engines. It's all combined together into a unique jazz-classical hybrid occasionally punctuated by readings of his short, playful poetry. Mostly self-trained as a musician, he was adept with many instruments and even invented a few of his own. During his years busking in New York he eventually connected with some major composers of the era who helped get him to record studio albums and even conduct major orchestras. 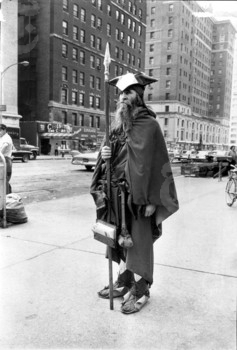 Despite reaching the heights of conducting symphonies in Carnegie Hall he remained devoted to the streets, regularly donning his hand-made Viking garb, rain or shine, to stand out and play for pedestrians. Surely the most fascinating character I've come across in a while, his story sounds mythical and his sound is mystical. He even has a timeless look to him, his face could be the face of Da Vinci or Aristotle. Thankfully there appears to be a documentary about him slated to be released this year. 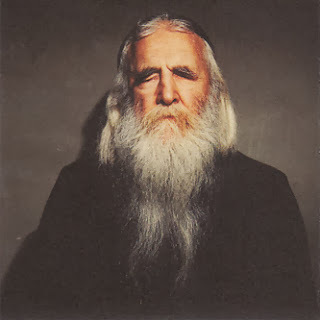 A few of my favorite Moondog sound clips will follow. The first one should be strikingly familiar.